Do you think I can change it in a day? How can I place you above me? --Neil Young, "I Believe In You"
In March of 2005, Neil Young got the news that no one wants to hear: he had a brain aneurysm. Of course, what did he do between diagnosis and surgery? He wrote and recorded Prairie Wind. And then, Jonathan Demme made a movie, Heart of Gold, centered around the new songs, at The Ryman in Nashville, where his 2010 Twisted Road Solo Tour just passed through for two shows. But what I tend to forget is that two days after his aneurysm surgery, Neil Young went on a walk outside his hotel. He only made it half a block. His femoral artery, where the surgeons entered his body to access his brain, burst on the street. There was blood in his shoe. He barely made it back to the hotel. Neil Young was unconscious, but an emergency crew responded and revived him. 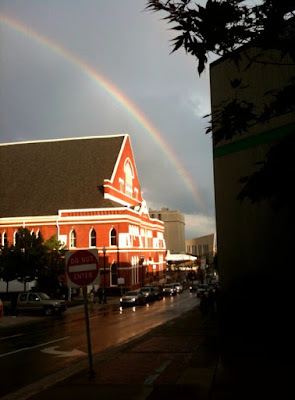 Somehow, revival and The Ryman go hand in hand with Neil Young and his music. On his current tour, Young is performing solo, bringing out a number of hits along with a wealth of new material. It isn't a solo acoustic jaunt; it's thunderous at times, so much that when Young plugged in and delivered "Down By the River" on Wednesday evening, you could feel the vibrations in The Ryman's pews (yes, you sit in pews at The Ryman). If there's anything that needs to be said about this tour, it's that Young is feeling something serious and close to home in his heart. His first three songs, "My My, Hey Hey," "Tell Me Why," and "Helpless," were performed beautifully and acoustically, with Young sitting down, comfortable, singing so sweet that almost everyone sang along: "Helpless, Helpless, Helpless"...we sang with him. It was a special moment for me since that's the only song I can (sort of) play on guitar. And finally, I was watching him play it, at one of the best venues I've ever visited. I'll be honest: I held back tears. Neil Young does this to you in a solo setting. For me, and I've seen him 19 times now, it's the best way to see him perform. The songs are stripped down, with every word hitting you clearly like the first time you sang along to "Old Man" in your car with a friend, or in your living room when no one else was around. It's why I will probably try to catch Young again on this tour--he hasn't done a solo tour in the U.S. since 1999. It's a special landscape for a man and his art. And luckily, Young is still creating his art. There were plenty of new songs featured at The Ryman, and while, lyrically, they're all pretty direct, they do come from a special place. One of the best ones, "You Never Call," a song presumably about Young's friend, the late L.A. Johnson, included lighthearted lines like "You're in heaven with nothing to do/ The ultimate vacation with no back pain." Another new one, "Love and War," was just as strong. "I sang for justice and I hit a bad chord, but I still try to sing about love and war," Young sang. Like I mentioned earlier, it seems something special has hit Young. Even the older songs he chose to perform, like "Cortez the Killer," "Ohio," and "Cinnamon Girl," seemed new and fresh. Young gave every song, old or new, an eerie sense of space, a new sense of freedom that didn't once belong. A new twisted road. If you do get to see Young on this tour, go in with a clear mind. Go in with a sense that you're going to hear your favorite songs performed for you for the first time. Go in wanting to hang on every word, every note. Go in realizing that we're lucky Neil Young is still alive, still creating, and not resting on his laurels. When the show was over, I thought of my first Neil Young show in St. Louis at The Fox Theatre. I went with my sister, Joy, and we sat in the second row in the orchestra pit. I remember watching Young walk out on stage that night. My sister nudged me and whispered, "There he is!" I'll always remember that moment--Neil Young, alone, sauntering out with a wry smile, waving his hand, and then blowing us away with a few acoustic guitars, a banjo, various harmonicas, an upright piano, a grand piano, and a vintage organ. I met Neil Young that night. He even took a picture with me. All I really told him was "thank you." 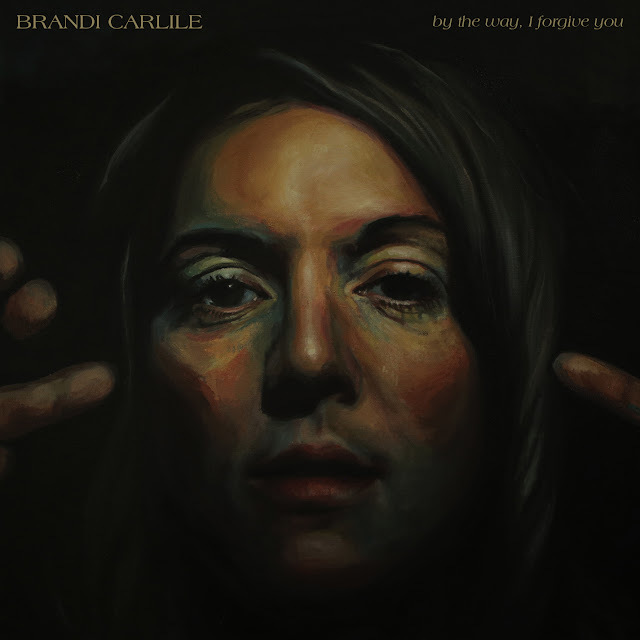 Interview | Brandi Carlile: "I've always just thought I was a singer."